The Danger of Cat Bites and How to Stay Safe? Our feline friends are cuddly and cute but we can’t forget that as animals, they still have tools to defend themselves, namely their teeth and claws. Fortunately, most cats prefer running away to fighting but some situations could still put you in harms way. Some biting and swatting can also be playful but accidents can happen and injury can still occur. When you sustain a bite from a cat, the wound may look simple but all cat bites that penetrate the skin should be taken very seriously, as they commonly get infected. Cats host several kinds of bacteria in their mouths that when introduced into a wound through a bite can lead to painful swellings, abscesses, and even septic infections when bacteria get into the bloodstream. Cat bites can be serious, but we’re here to help. In this article we’re going to discuss reasons why cats may bite a person, how dangerous these bite wounds can be, signs to look for when a bite wound is infected, how to immediately address a wound, and how to seek further help. Most importantly, we’ll give you tips on how to avoid getting bitten by your cat altogether. Biting is an undesirable behavior. There are different things which can trigger a cat to bite people. A cat might bite if it feels threatened, if it is not approached calmly, if it is depressed or if it is teased. Sometimes, a cat bites as a form of communication. It might also seem playful. This type of bite is often called “Cat love bite”. A cat love bite typically doesn’t break the skin but you still have to be careful. Make sure you avoid doing those things and be aware of these reasons to prevent getting bitten by cats. There are different scenarios that can trigger a cat to bite a person. Fear: any cat that is experiencing fear or anxiety may be quicker to lash out with her claws or teeth. Redirected aggression: sometimes, through surprise or frustration from seeing another animal like the neighbor’s cat outside, from a sudden loud noise, or when startled while sleeping, cats may redirect an aggressive response towards an innocent bystander, like their owners. Play-biting: Sometimes, a cat may bite a person affectionately or as a form of communication. This type of bite is often also called a “cat love bite”. Play-biting or love-biting typically doesn’t break the skin but you still have to be careful. If a kitty does this as attention-seeking behavior, it may escalate over time. 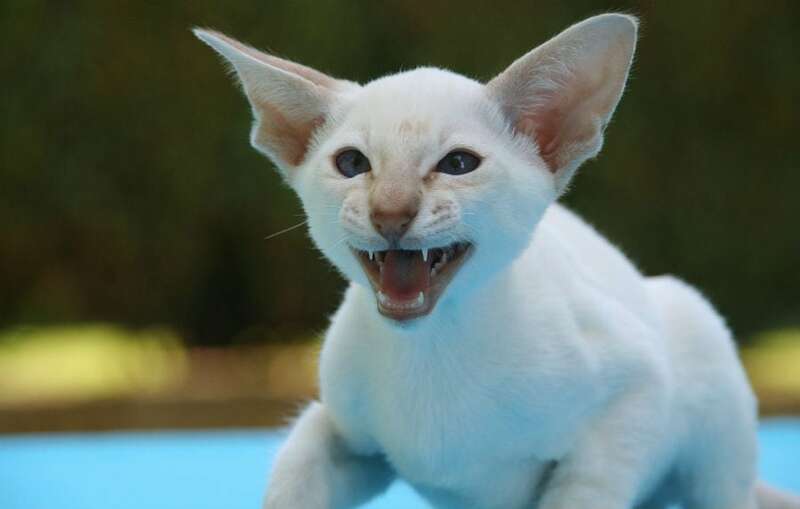 Cats might be small compared to other animals but they have sharp and pointed teeth making their bites penetrate the skin as puncture wounds. Most cats are asymptomatic carriers of a host of bacteria in their mouths, including Pasteurella and Bartonella. This means that while they have these bacteria in their mouths, they are otherwise healthy and show no signs of illness. When introduced into a wound through a bite, these bacteria can cause serious illnesses including pasteurellosis and cat-scratch disease, leading to pain, swelling, and fever. If you have been bitten by a cat and notice any of these signs, seek immediate treatment from your physician. While all cat bites that penetrate the skin should be seen by a medical health professional, there are some simple first steps you can take after being bitten to delay infection. Control any bleeding by putting pressure on the bitten area using a clean cloth. If bleeding doesn’t stop after applying pressure for 15 minutes, go to the nearest hospital or urgent care center. As long as bleeding can be controlled, make sure to wash the wound thoroughly with soap and clean water for at least 10-15 minutes. Apply an antibiotic cream, if you have one, to reduce the risk of infection. Apply a sterile bandage to cover the wound. Make sure to clean your wound and change the bandage regularly, but seek professional medical help as soon as possible, even if the site appears clean and free of infection. When seeking care from a medical health professional, he or she will ask you about the incident including what happened and what time you were bitten. Your wound will be additionally cleaned and treated. Antibiotics are often prescribed, as well as pain medication if indicated. You may also be asked about the last time you were given a tetanus vaccine and if it is out of date, a booster vaccine may be advised. Although uncommon, additional testing, like bloodwork and x-rays, may be recommended if you are showing signs of a more severe infection, or if you may have a compromised immune system. Most cat bites, because they are small but deep, don’t require stitches, but some more advanced wounds may in some cases. It’s very important to know if the cat your were bitten by is up to date on a rabies vaccination. If this is your own cat or sometimes a friend’s or relative’s cat, this makes it very easy. However, if you’re bitten outdoors by a wandering neighbor’s cat or another stray cat, knowing the cat’s rabies vaccine status is very important. If you cannot determine if a cat is up to date on a rabies vaccine, contact your local animal control department. The cat may need to be quarantined and monitored for signs of rabies. If ever in doubt, make sure to inform your medical health professional that you may have been bitten by an unvaccinated cat. A post-exposure treatment may be indicated just as a precaution. An active rabies infection is always fatal but fortunately can always be prevented with early treatment before any signs occur. Although we’ve talked a lot about what cat bite wounds look like and how to address them, you should always try to avoid getting bitten in the first place! Here are some tips for you and your family to avoid situations where a cat bite might occur. Always handle kitties gently and quietly. This is especially true for young kids. Loud noises and quick, rough handling can startle cats into defending themselves. Cats use body language to express themselves. If a cat’s ears are flattened down on her head, this can be an initial sign that she is annoyed and is looking to avoid any further stimulation. Tail wagging is usually a sign that he’s tense or unhappy. Sometimes he might also whop his tail around when playing, but this can also be a sign that he’s ready to pounce. Make sure a toy is readily available instead of your hand. If a cat is routinely play biting at your arms, legs, or ankles, discourage the behavior first and then try to redirect with a toy. Do not reward biting behavior with food or treats, as this may encourage the behavior. Never tease a cat when she is angry or frightened. Fortunately, most cats will swat with their paws first if they want you to stay away and only use their teeth as a last resort. Cats using hissing as a warning sign that they are displeased and would prefer to be left alone. Always approach your hissing cat with caution and if in doubt, leave her alone and come back later. In a multiple cat household, if a fight breaks out, never try to pick up or handle one of the cats involved, as this can lead to redirected aggression towards you. Always use some other way to break up a fight, like a water squirter, non-toxic aerosol spray, or shoo them into separate rooms to be apart from each other for several minutes. Train and socialize your cat from a young age to prevent her from being aggressive to people. If when sitting on your lap, you notice your cat’s eyes start dilating, ears start moving back, and the tail starts wagging, be on guard. These are signs of wind up, meaning something is stimulating your cat, which could lead to redirected biting or scratching. Avoid contact with unfamiliar cats and especially outdoor stray cats. 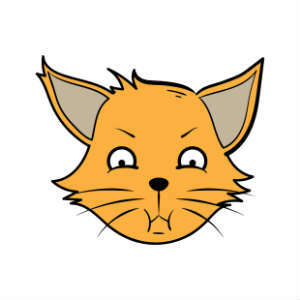 If an outdoor cat appears to be showing erratic, unusual, or unwarranted aggressive behavior towards a person, call your local animal control department immediately, as it’s possible the cat could have rabies. If you are concerned your cat may have a behavioral problem causing biting behavior, like anxiety, fear, or aggression, make sure to consult with your veterinarian to discuss possible medical therapies that may be warranted. Remember, a cat bite wound can be very serious and should always receive prompt attention. But fortunately, many cat bites can be avoided by taking simple precautions. As much as we love our own kitties, or may want to help an unfamiliar cat, make sure to always put your own safety first, to avoid injury.